Honestly, I don’t know where the month of April went, I really don’t. One minute I have great plans for everything that’s going to get done: we’ll get a wedding date nailed down, I’ll get that ceiling fan installed, I’ll spring clean my closet… and the next thing you know, it’s almost May and none of that’s happened. But I don’t know where the time went. It’s like I blinked and it’s over. Oh well, I’ll do better this month, right? Sometimes you’re up and sometimes you’re down, but it will never last either way. May will be better. 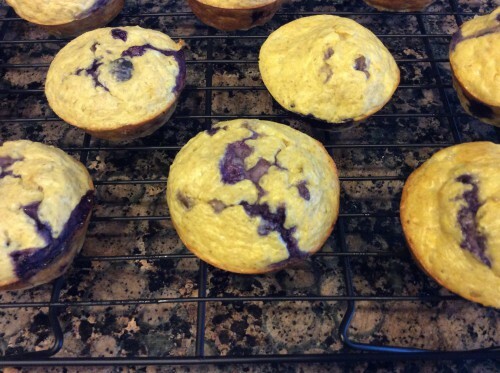 But since I’m in a quick and easy mood right now, I’ll share my latest quick and easy high protein muffin recipe. Just throw the ingredients minus the blueberries into a blender and let it go. Pop the muffin tin into the oven and in no time flat you’ve got your perfect pre-workout snack in a convenient muffin form without the extra sugar and fat they normally contain. I hope you enjoy and I’ll see you all later! Grind the oats in a blender until they achieve a flour-like consistency. Pour the oat flour into a bowl and add the protein powder and mix well. Next, add the cottage cheese and egg whites (or Egg Beaters), Stevia and vanilla extract, and mix by hand until well blended. 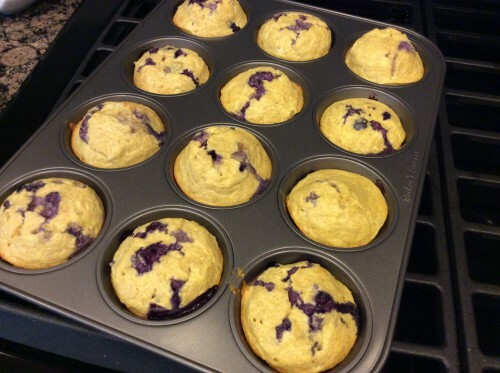 Pour the batter into 12 greased muffin tins, and bake in the oven for 20 minutes. Remove and store in an airtight container in the refrigerator for up to 10 days. You can’t tell by looking, but these are super healthy for you.